There are going to be some huge announcements at Microsoft Ignite that you definitely do not want to miss! This is going to be by far the most exciting Ignite ever with crazy announcements on what Microsoft is delivering inside its cloud offerings. I am genuinely excited at the anticipation is killing me, its made worse because I won’t be there to physically witness it. Sure I will be watching the live stream but I will miss out on the atmosphere when announcements are made. However, in case I am called away from the stream and have to do real work I want to make sure that I at least capture what is announced for later. 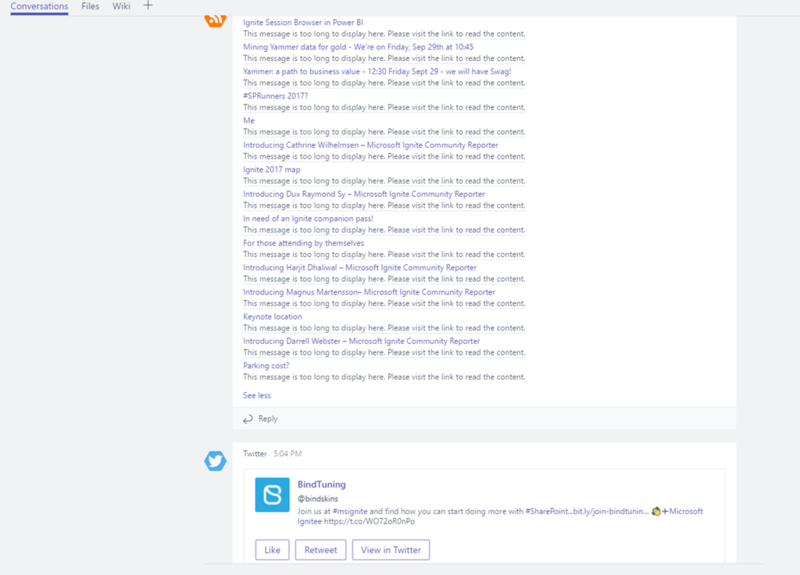 I can do this using Microsoft Teams to track social reactions and also follow aggregators using RSS feeds to make sure I have the content in one place at my fingertips on any device I am able to access at the time. First off I recommend creating a dedicated channel for this within a Team that you use for general information sharing that is not company specific. I assume that you already know how to do this (clicking the Team ellipsis and clicking Add Channel). 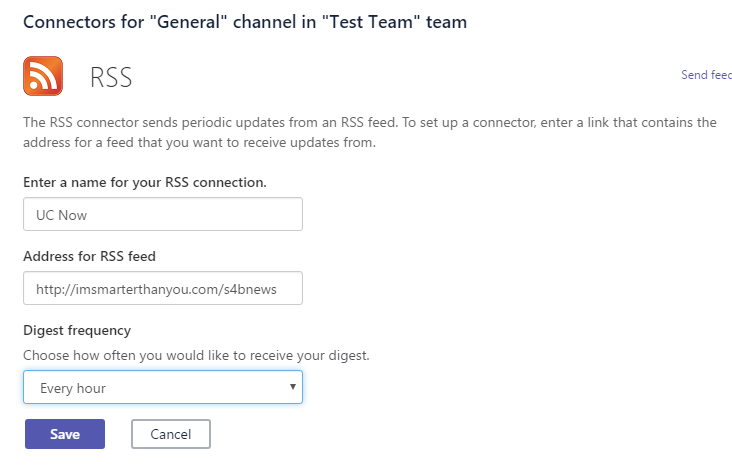 Add a name for the RSS feed e.g. UC Now or Ignite Blog. 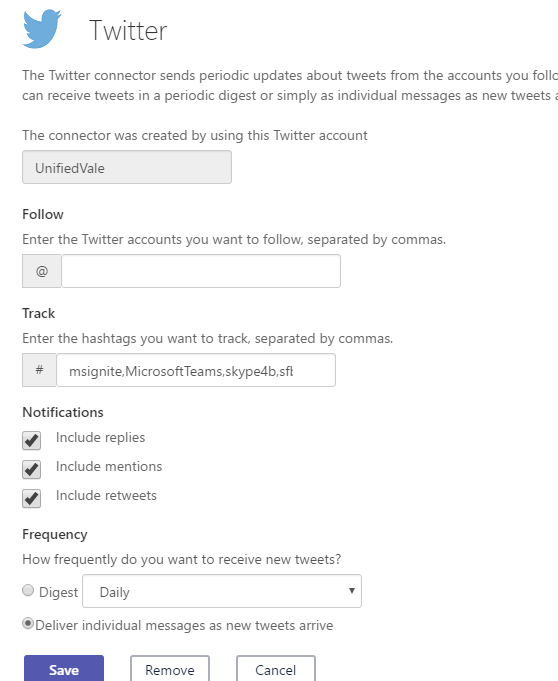 Then paste the above RSS feed in and choose the frequency you want to poll the feed. For ignite, I recommend the fastest time frame possible. 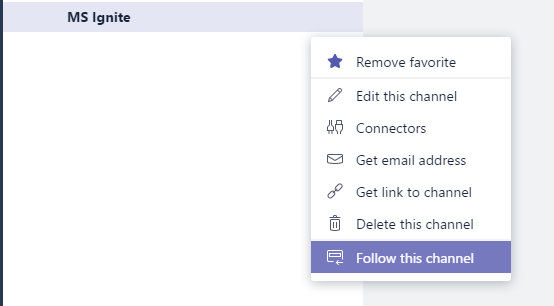 Now you will want to add a new twitter account to the connector, you can do this by clicking on the add new twitter account. Once you have authenticated with Twitter then you’re able to select the account to use. So get your Teams set up ready for the big event!